These are optional Light Green Kyosho Inferno Big Bore shock springs, this is the Medium length and are used on the front of the rear of the MP9 as well as the front of the MP777 STRR truggy. These are considered a Hard spring rate. 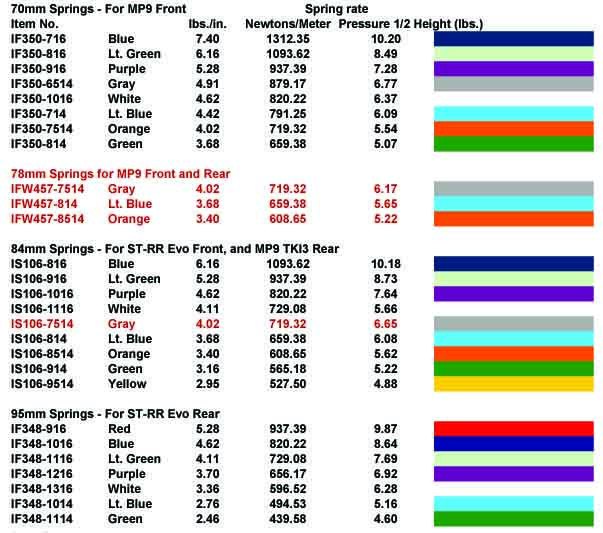 These are some guidelines for choosing different spring rates for your setup on your Kyosho Inferno. Remember that every change you make to your setup will effect something else. It is a good idea to experiment by changing settings to get a feel for how changes effect your car with your driving style. Further reading on the subject of chassis set will also help. Try and hang with experienced drivers at the tracks you race at will also help immensely! The part number of the Kyosho spring has the wire thickness and number of turns included in it. 7 turns of 1.6 thick wire. This can be extrapolated to all the springs and you will see the pattern evolve for the spring rates. Just think of this like a spring is a piece of wire. If you straightened out the wire and held it on one end, the longer it is, the easier it would bend by pushing on it from the opposite end. The same would hold true for a thinner piece of wire, it would be easier to bend as well. This is how springs are actually working. The longer the wire the easier it is to bend and therefore the softer spring rate it has. An advantage of lower turns and thinner wire is you can create a spring with lighter weight vs. a spring with thicker wire and more turns. Keep this in mind when choosing springs to run as well. I hope this explanation helps rid some confusion about how the above charts work.